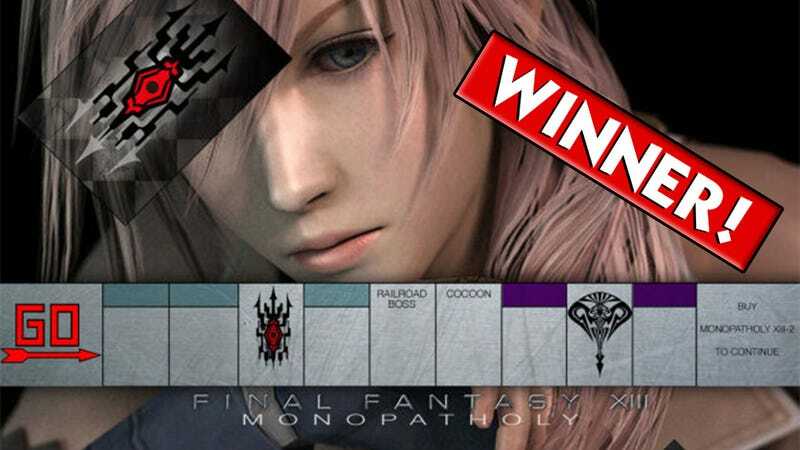 Kotaku 'Shop Contest: Now Board Gaming: The Winners! Last week I asked our ridiculously creative readers to create the video game themed board games of their dreams. Or possibly nightmares. We've wound up with a bit of both, really. First of all, I'd like to thank our brave entrants for suffering through last week's image upload problems, and for not creating board games using some of the images we were fighting to keep out of the comment sections, because ew. Then I'd like to address, before it becomes an issue, the theme of this week's winning entry from the ever-so-talented halfbeast. Yes, it's a cheap shot at Final Fantasy XIII, and we've been accused in the past of beating the living daylights out of the poor game. Thing is I like Final Fantasy XIII. I have friends who are Final Fantasy XIII. I love the style, the combat, some of the emotional cues — but yeah, it was pretty damn linear, and halfbeast's creation captured that aspect of the game quite nicely. I especially appreciate the Railroad Boss space. So halfbeast wins, but he's not the only winner this week — just the best. The rest ain't nothing to sneeze at. Eric Pheris — because who can keep all of these straight? Darkfoxx — because your mom goes to college. Chrury Sanson — because you never, ever wake Tingle. Barfalamu11 — because I was really hoping for some Pop-a-Matic bubble action. Berfince — because I could take 'em. HylianHeroBigBoss — even though it's missing the "Jason!" button. Green Monkie — for the nostalgia overdose. penultimate — for the souls of those we couldn't Phoenix Down for some reason. Modus Ataraxia — though I'd never guess in a million years. Thorn_Blackstar — because this would be AWESOME. jpolchowski — because it would work. spartanwarrior — for being the good kind of dumb. Clutchy — because it fits perfectly. Koyawata — because everything is better with sharks. killergoat72 — because I'm surprised this hasn't been made yet. mulled0220 — aw man, I loves me some Clue. ParamediaFoetus — for making me look up Buckaroo. edy_pagaza — because this is some lovely work right here. Jinder — because I laughed. sciteach — but isn't this how Scrabble is normally played? KIREEK — because I have a soft spot for Barbie's Dreamhouse Party. Der-Kleine — because it's rather clever, and I read the whole thing. uscg_pa — because you know it would sell like crazy. DethDonald — because he's just a regular dad, playing some Twister. GiantBoyDetective — for Misty and Brock dying of dysentery. arniejolt — it's the fun game we're forced to play! NellChan — because I want this. Maybe with smaller weapons. MrDeadScott — for the Fat Princess reference. halfbeast — for the win. Hopefully these image uploading issues will all be cleared up for tomorrow's contest, which will probably only run until Tuesday night, as next weekend I'm getting a little surgery done to make my spine stop hurting my lower bits. If all goes well, we'll continue the week after. If not, well... nice knowing you all.